The global military UAV market report covers manufacturers like Israel Aerospace Industries, EMT Ingenieurgesellschaft, AAI Corporation etc. LEWES, DELAWARE, DELAWARE, UNITED STATES, July 12, 2018 /EINPresswire.com/ -- The Military UAV Market, valued at US$12.2 billion in 2018, is projected to grow at a CAGR of 4.09% over the forecast period, to reach US$18.1 billion by 2028. Realizing the benefits provided by UAVs as force multipliers, various countries are allocating substantial defense budgets to the R&D and procurement of advanced UAVs. UCAVs and HALE UAVs are more in demand by major defense spenders such as the US, Russia, the UK, and China, whereas MALE UAVs and TUAVs are finding growing markets in developing countries such as India, Brazil, and the UAE. The global military UAV market will be driven by internal and external security threats, territorial disputes, and modernization initiatives undertaken by armed forces across the world. Significant UAV customers include countries in the Asia Pacific and North American region, and the global UAV market will be dominated by the US throughout the forecast period. Asia Pacific’s share of the global UAV market is also projected to increase, largely due to a number of international territorial conflicts and insurgency issues. 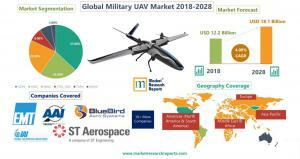 The military UAV market is expected to be led by Asia Pacific with an estimated share of 35.6% over the forecast period followed by North America and Europe with shares of 29.6% and 24.3% respectively. The Middle Eastern market for military UAV is expected to account for a share of 7.5% followed by the African and Latin American markets with cumulative share of 3.0%.